The fall of 1957 was a seemingly idyllic, even prosperous, time down in southern Virginia. A young housewife, Charlotte Bliss, lives with her husband, “Press” Bliss, and their two young children, Eva Grace and Michael, in the gorgeous Bliss family home. On the surface, theirs seems a calm, picturesque life, but soon tragedy befalls them: four deaths, with seemingly simple explanations. But nothing is simple if Bliss House is involved. Charlotte, nearly crippled with grief, feels more and more isolated from everyone around her. The only thing that brings her solace is going through the old photos and curiosities left behind by her mother-in-law. Then she makes a startling discovery that points not to tragedy, but to murder. How far will Charlotte go to discover the truth? And how far will she get without knowing who her real enemy is? Not for the faint of heart, or those disturbed by sexual situations and violence, Charlotte’s Story injects new levels of horror into the classic Southern gothic. 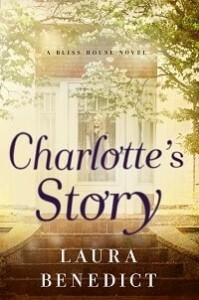 Laura Benedict is the author of Charlotte’s Story and Bliss House, the first two novels in the Bliss House trilogy, as well as several other novels of dark suspense. Her work has appeared in Ellery Queen Mystery Magazine and numerous anthologies. She lives with her family in Southern Illinois. Visit laurabenedict.com. Connect with Laura on Facebook and Twitter.